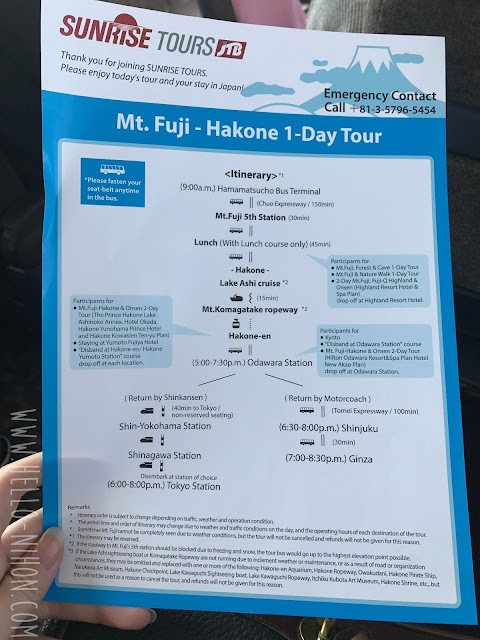 I booked a Fuji tour via Viator (this is not a sponsored post) and the tour itself was operated by JTB Sunrise Tours. There were many different options to choose from: lake tours, rope way tours, half day tours, 2 day tours, etc. Even the plan we chose had a lunch and no lunch option. We ended up choosing the Mt. Fuji - Hakone 1-Day Tour with Meal, Return by Shinkansen. You can click above to see my detailed impressions of some of the stops that we went to. But overall, I have to say that I would recommend this tour and the company, but not the package that we chose. To be honest, I think most of Hakone could've been skipped. For the most part, it just consisted of long lines, a crowd, and being rushed and only getting to spend 15 minutes at the top of the mountain because the line to board was so long (in the case of the rope way). The cruise wasn't anything special, either, and I definitely think they are very generous in calling it that. The bus was actually late because we had to stop and pick up some other people from a tour bus that had broken down ahead of us. (Seriously.) So we ended up having to run to catch the boat. The views were nice, but it was definitely just a means to get us to the rope way. And then, there was a bunch of traffic due to an accident (according to Google Maps anyway) so we ended up getting to Odawara Station after 8 PM. Because the Shinkansen tickets were non-reserved, it didn't matter what time we boarded, but my mom and I ended up missing the first train by a few seconds because the tour woman was taking too long talking. If you know what you're doing when it comes to trains in Japan, hop off the bus and go on your own. There's no need to wait for the tour guide. Overall, the convenience of having a bus to go up Mt. Fuji was the only real benefit of this tour. 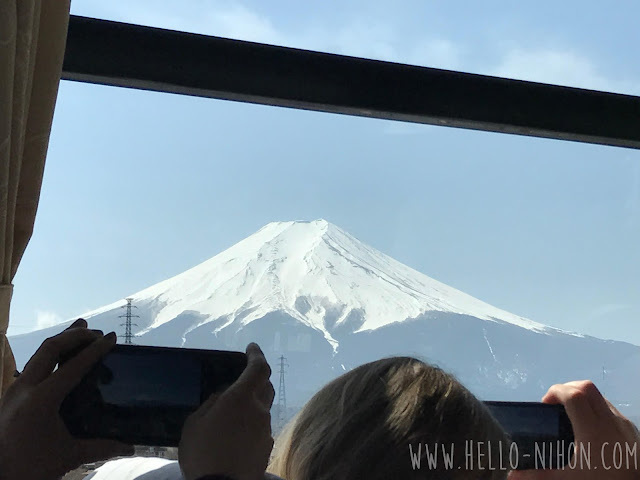 However, when you're actually on the mountain, it looks just like any other... To be honest, I enjoyed Fuji most from afar. It was breathtaking driving by on the bus. So, depending what you want from this tour, I could say your experience could go either way.